Women related to men who fought alongside the rebel police officer Oscar Perez wait for their loved ones' bodies to be turned over, outside the morgue in Caracas, Venezuela, Jan. 17, 2018. Seven people died fighting against police and soldiers Monday in a small mountain community outside of Caracas, according to Interior Minister Nestor Reverol. Relatives of the seven rebels killed in a raid by Venezuelan security forces on Wednesday demanded access to their bodies, which the government has threatened to cremate. The seven, led by rogue police pilot Oscar Perez, were slain Monday in a siege on their hideout in the small mountain community of El Junquito, government officials said. 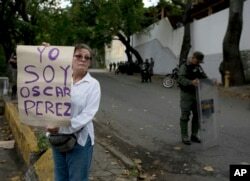 A women who said she was a supporter of rebel police officer Oscar Perez holds a poster that reads in Spanish "I am Oscar Perez" at a checkpoint near the morgue where his body is held, in Caracas, Venezuela, Jan. 17, 2018. Later in the day, authorities allowed Perez’s aunt, Aura Perez, to recover the ringleader’s body from the Bello Monte morgue in the capital city. Aura Perez was accompanied at the morgue by parliamentarian Delsa Solarzano, who’s on the opposition-controlled National Assembly’s special commission to investigate the deaths. She has requested autopsies. Solarzano said she and other lawmakers had been trying since Tuesday to help relatives gain access to the bodies. “We demand respect for the law,” she tweeted in Spanish. On Wednesday, armed security troops ringed the morgue where the bodies were being held. Another parliamentarian on the commission, Winston Flores, accused President Nicolas Maduro’s administration of extrajudicial killing. “There was an extrajudicial execution, and we want to prove it,” the French news agency AFP quoted him as saying outside the morgue. Oscar Perez, 36, had been a fugitive since last June, when he stole a police helicopter and buzzed the Supreme Court and other government buildings. Interior Minister Nestor Reverol, in announcing the deaths Tuesday, said Perez and his “terrorists” initiated the firefight. He said the fatalities included seven members of Perez’s group as well as two police officers who fought them. On Wednesday, civic groups reported that authorities had used a grenade launcher along with other weapons in attacking Perez and his group. The raid adds a new wrinkle to talks, set to resume Thursday, on how to resolve Venezuela’s political and economic crisis. Representatives of the Maduro government and its political opposition are scheduled to meet in the Dominican Republic for two days. Along with Perez and Diaz, authorities identified the dead rebels as Daniel Enrique Soto Torres, Abraham Israel Agostini, Jose Alejandro Pimentel, and brothers Jairo Lugo Ramos and Abraham Lugos Ramos. Authorities also said two police officers were killed in the raid: Andrian Ugarte and Nelson Chirinos.